Mango chunda is very easy and tasty as a side condiment, with Gujrati or north Indian meal as like methi thepla, ajwain poori, stuffed parathas, roti or chappati. Mango chunda has sweet, sour& little spicy taste. All this taste come together when you taste this chunda.In winter season when my mother used to make it moong dal khichari or moong -masoor(red)dal khichari, we would like to eat them with aam ka chunda. My children also like too much. 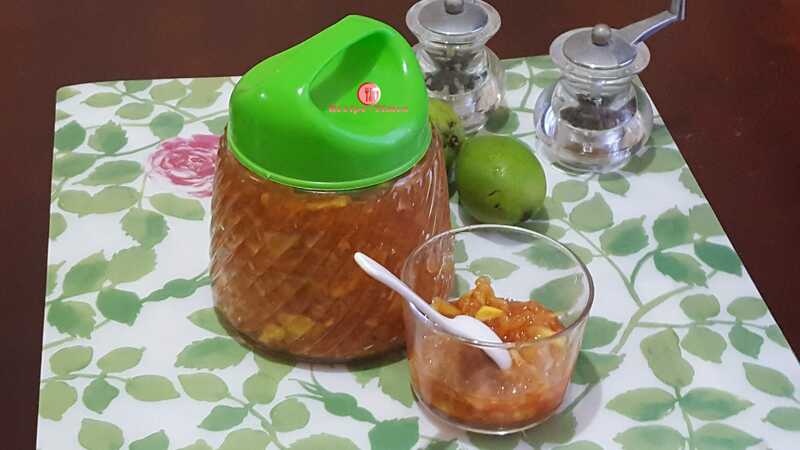 Take a glass bowl add grated mangoes and sea salt mix very well-cover with lid leave aside 3-4 hours, after 3-4hour mangoes leave the water, discarded that water. Take a nonstick karahi or pan, add the grated mangoes, sugar and black salt and cook on low flame for 5-7 minutes while stringing regularly till 1thread or string consistency. Switch off the flame, aftre7-10 minutes add all spices and mix well, once cooled serve and store in an airtight glass jar. If you like sour, tangy and spicy without oil mango pickle than make it mango heeng pickle.